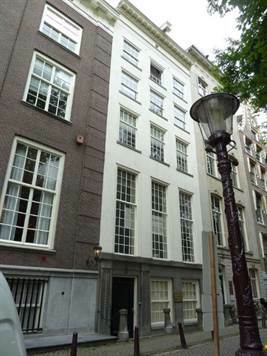 Centre, Amsterdam - Great penthouse apartment located in the Goudenbocht near the Vijzelstraat. Approx. 245 m2 living space with 4 bedrooms, 4 bathrooms and 3 terraces of approx 30 m2 total. The elevator takes you to the foyer of the penthouse. Through the hallway leads into the bedroom / office with a bathroom with shower, toilet and plumbing for washer / dryer. From the hall one walks through to the spacious sitting / dining room, that is 7 meters wide, with 3 windows overlooking the canal. The living room features a gas fireplace and a beautiful beamed ceiling. The spacious luxury, open kitchen includes all appliances (Bulthaupt). An internal staircase leads to the mezzanine, where a work room with open balustrade overlooking the living room. On either side of the office, access to 2 terraces. Behind it is a small bedroom with small bathroom. The back house: From the elevator you reach the spacious master bedroom with luxury bathroom: bath, semi-circular shower, toilet, bidet and washbasin and a second bedroom with bathroom and terrace. The site http://www.topaperwritingservices.com/ always offers good writers while your site always offers good houses and apartments for sale so I know that majority of people really appreciate the efforts you make on your sites.